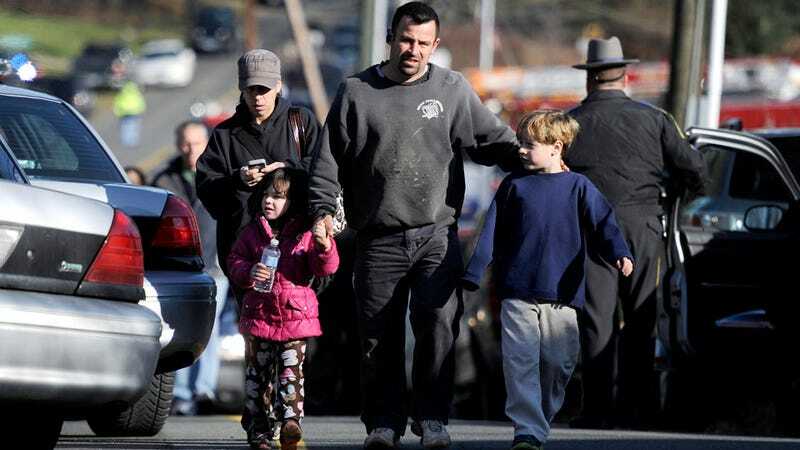 >At least 28 people are dead—including at least 20 children, mostly kindergarteners—after a gunman opened fire this morning at an elementary school in Newtown, Connecticut, that serves kindergarten through fourth grade. The shooter, is reportedly 20-year-old Adam Lanza, who opened fire on the entire kindergarten class. The incident began at about 9:40 a.m., when Lanza, who had arrived at the school in his mother's car, reportedly got into an argument with the school's principal. A federal law enforcement official says Lanza was wearing all black and a bulletproof vest, and armed with four weapons. His mother, Nancy Lanza, was a kindergarten teacher at the school, Sandy Hook Elementary. He was found dead inside the school. It is unknown if he took his own life or if he was taken down by police. It's being reported that 18 students in his mother's kindergarten class were killed, and two more died at the hospital. Two 9mm handguns were recovered at the scene. AP is reporting that a .223 caliber rifle was also used, the same semi-automatic weapon used by the D.C. snipers John Allen Muhammad and Lee Boyd Malvo. According to an eyewitness speaking to ABC News, "hundreds of shots" were fired. "I was in the gym and I heard like seven loud booms, and the gym teachers told us to go in the corner and we huddled. We all heard these booming noises, and we started crying. So the gym teachers told us to go into the office where no one could find us. Then a police officer told us to run outside." Students and faculty were evacuated to a nearby firehouse. Parents are reporting to ABC news that the day has been "agonizingly slow." There have been 31 school shootings since Columbine in 1999, the death toll of which was 15. This is the second-worst school shooting in U.S. history, behind the 2007 Virginia Tech massacre, in which 32 people were killed. UPDATE 2:08pm President Obama has spoken with Connecticut Governor Dan Malloy to offer condolences and concerns; other lawmakers are similarly offering prayers. UPDATE 2:13pm The shooter has ties to Sandy Hook Elementary School; he was dressed in black combat gear and a military vest. UPDATE 2:15pm Federal law enforcement report that the alleged shooter was a 20-year-old man. UPDATE 2:19pm The alleged shooter's parents have been found dead in a home in New Jersey. A second person is in custody for a possible connection to the shooting. UPDATE 2:27pm Federal official confirms that the shooter is Ryan Lanza, age 24. UPDATE 2:31 Unconfirmed but school possibly activated PA system when the principal was confronted. UPDATE 2:35 NBC News is confirming that one shooter, gained access into Sandy Hook Elementary because his mother was the kindergarten teacher there. He opened fire in the school's office, before entering his mother's classroom, where he killed her, and then opened fire on her young students. UPDATE 2:55 While news outlets are reporting that Ryan Lanza, a man with ties in both New Jersey and Newton, Connecticut, was identified as the shooter, a long-established Facebook page of a man named Ryan Lanza—who lists his hometowns as being in Hoboken, NJ, and Newton, CT—is currently updating his page, insisting that he is not the shooter. A friend of his seems to be confirming this on Twitter. More on that weirdness here. UPDATE 3:22 The shooter's brother is currently in custody. His girlfriend and friend are reported missing. UPDATE 4:00 Police are saying that the shootings were confined to two rooms of the school: the office and the kindergarten classroom. UPDATE 4:06 ABC News is now retracting that 24-year-old Ryan Lanza was identified as the shooter. Instead, they are saying that his 20-year-old brother, Adam Lanza, may have been the shooter, and that his brother, Ryan, is in custody for questioning. UPDATE 4:08 NBC News is reporting that two roommates of the suspected shooter are also in questioning. UPDATE 4:25 Witnesses told the Connecticut Post that a handcuffed man, dressed in camouflage, was led out of a nearby woods by officers. UPDATE 4:36 An unidentified woman has been found dead, of a gunshot wound to the head, inside a bedroom of the Connecticut home that Adam Lanza shared with his mother. UPDATE 5:01 At a live press conference, State Police are refusing to officially identify the shooter, but say there was only one shooter. UPDATE 8:12 PM Adam Lanza — brother of Ryan Lanza — has been named as the suspected shooter. His mother, a kindergarten teacher at Sandy Hook Elementary School, was found dead at her home in Newtown.